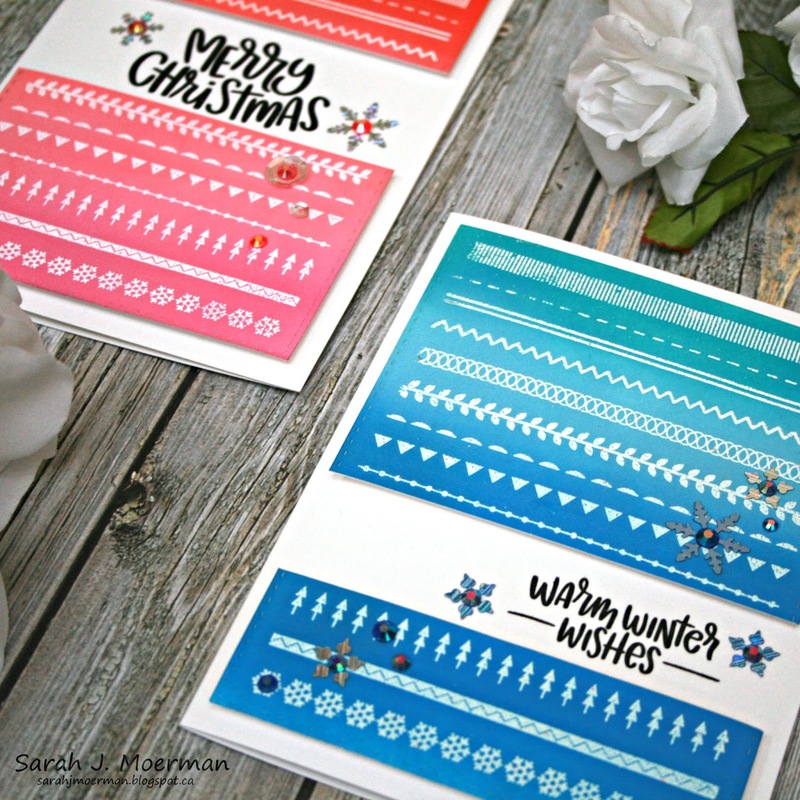 I'm popping by to share a card made with Simon's fabulous new Outline Snowflakes Background Stamp which came out as part of their Fun and Festive Release and announce the winner of the Simon Says Stamp November Card Kit. 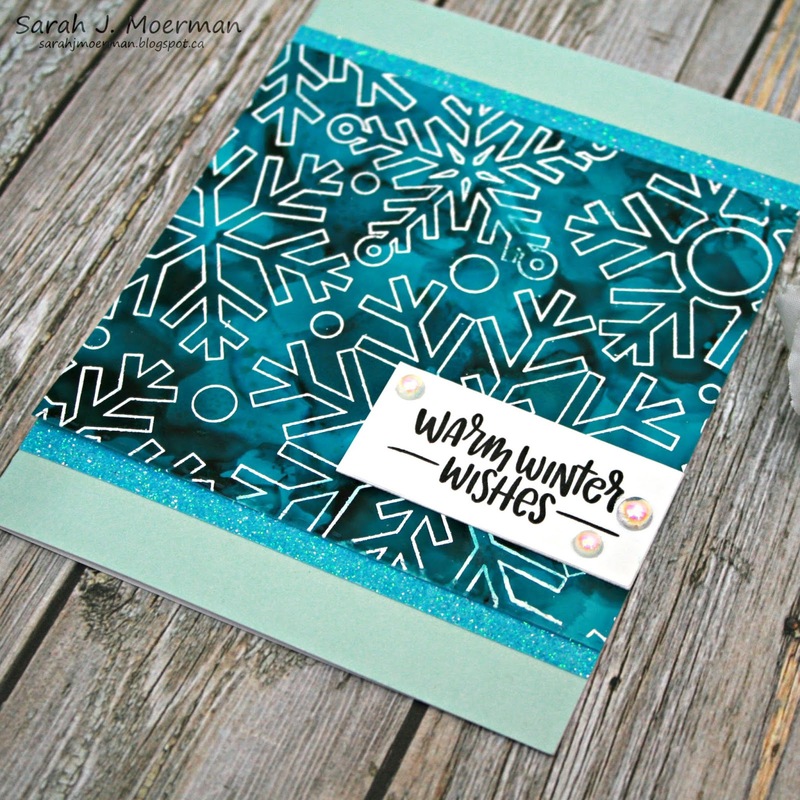 For today's card I created my background with Stream Alcohol Ink, Snow Cap Mixative, and Blending Solution on Yupo Paper, using a Distress Marker Spritzer Tool to move the ink around. 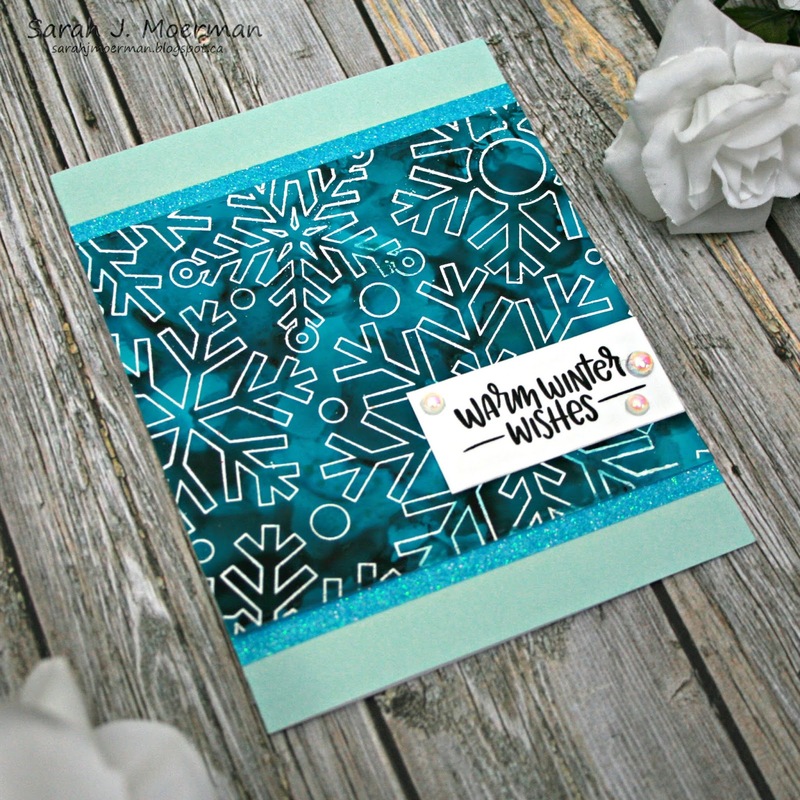 Once dry I white heat embossed Simon's Outline Snowflakes Background over top. 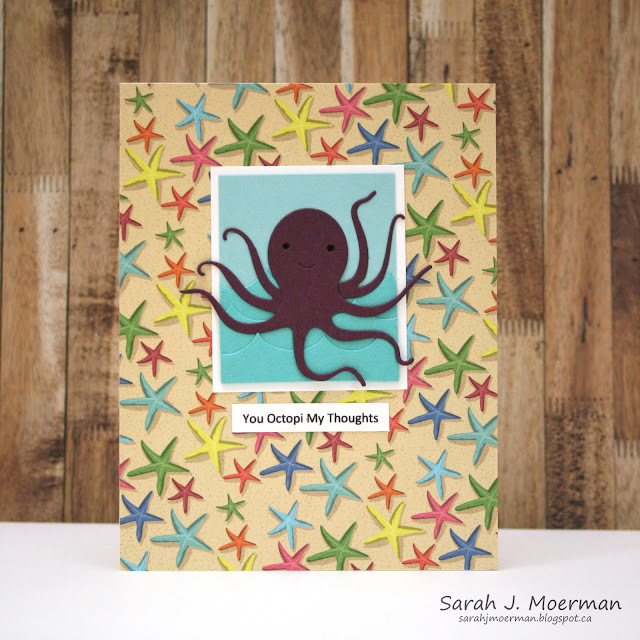 I added stripes of matching Simon Says Stamp Glitter Paper to the top and bottom of the panel and adhered it to a Hero Arts Notecard. 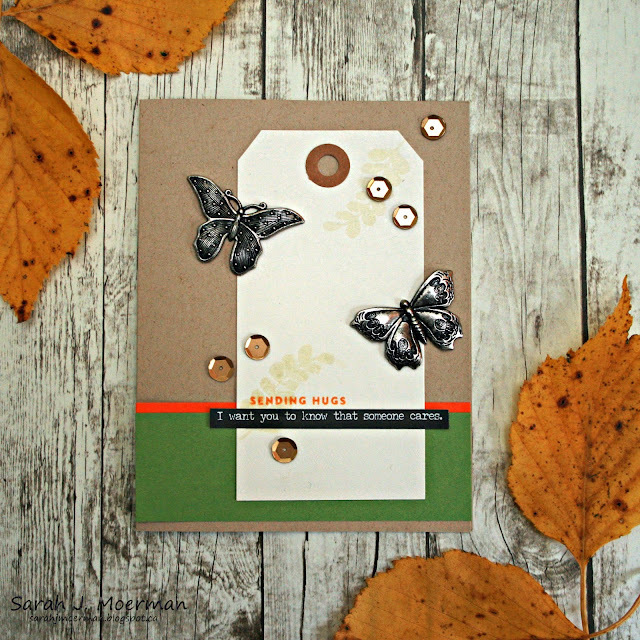 The sentiment from Simon's Critter Sweaters Stamp Set was stamped on a piece of cardstock cut using one of Simon's Sentiment Labels Dies. 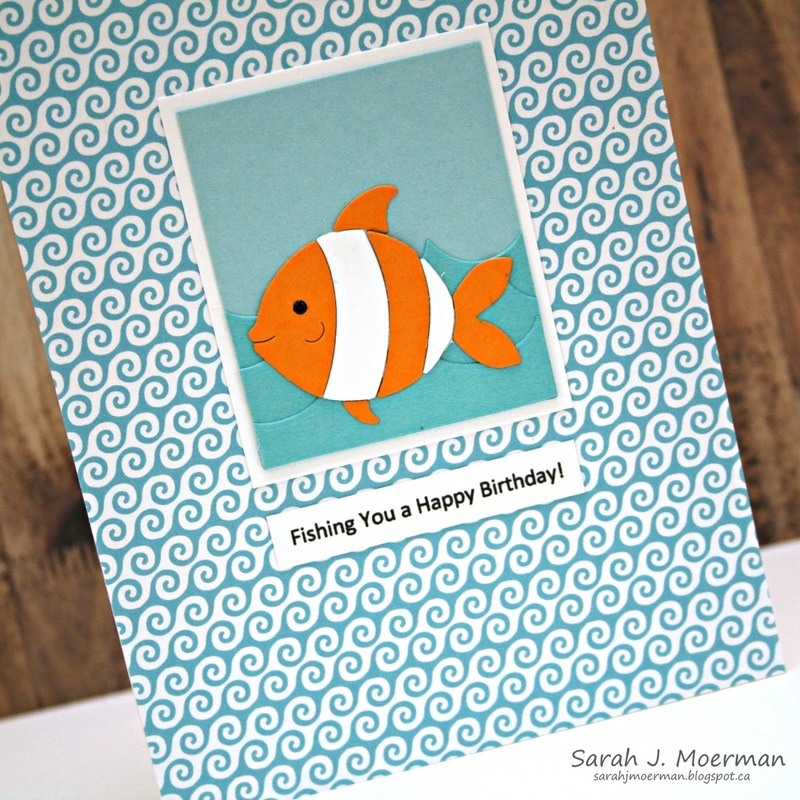 I finished the card off with some Studio Katia Iridescent Bubbles. That's lovely. 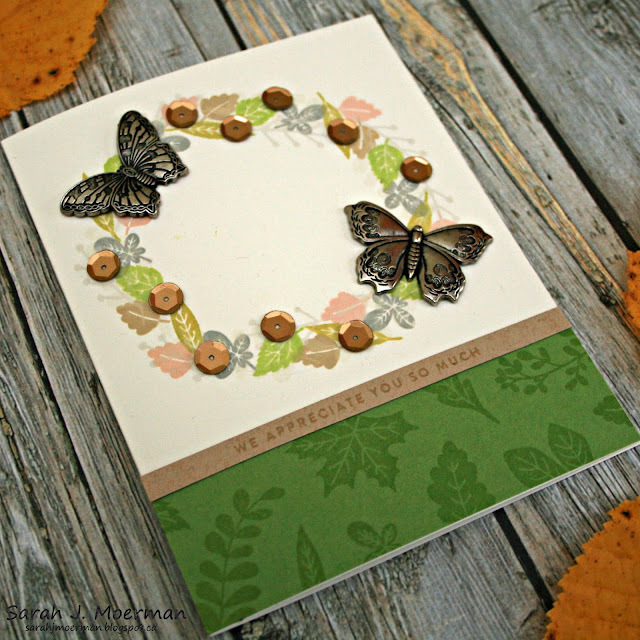 I love those butterflies and the leaves in the stamp set are gorgeous. Congrats Jackie! Please message me with your mailing info via the contact me button on my sidebar so I can pass your info on to Simon Says Stamp. 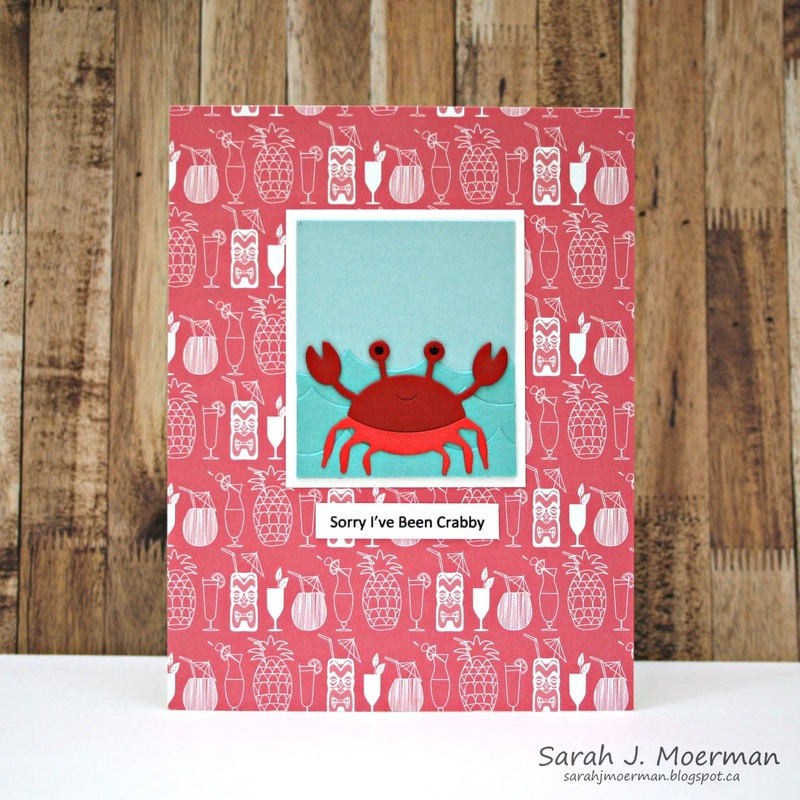 I'm back to share a final card featuring the Simon Says Stamp November Card Kit. 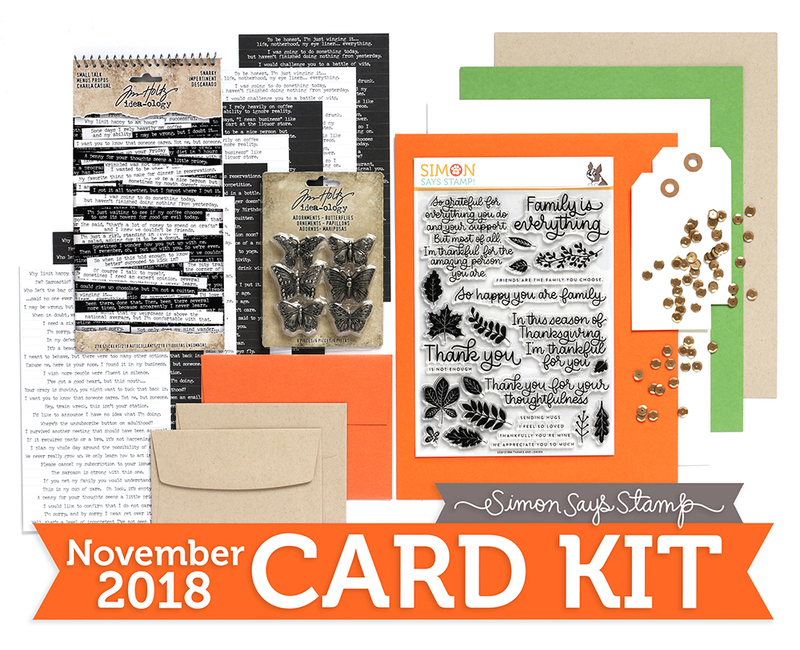 The Simon Says Stamp November Card Kit sells for $34.99 USD + shipping. 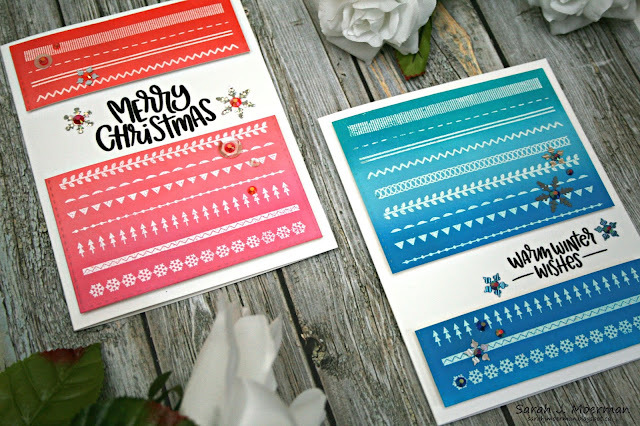 If you'd like to receive this and future kits for $29.99 USD + shipping per month, you can SUBSCRIBE HERE. This is the best way to make sure you don't miss out! 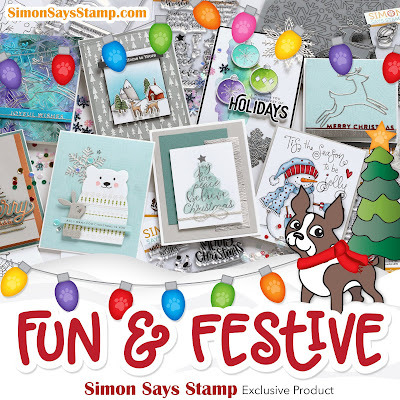 Heidi, owner of Simon Says Stamp, has given me an extra Simon Says Stamp November Card Kit to pass on to one of you! Just leave a comment on any or all of my November Card Kit posts and I'll announce a winner Monday October 22th. 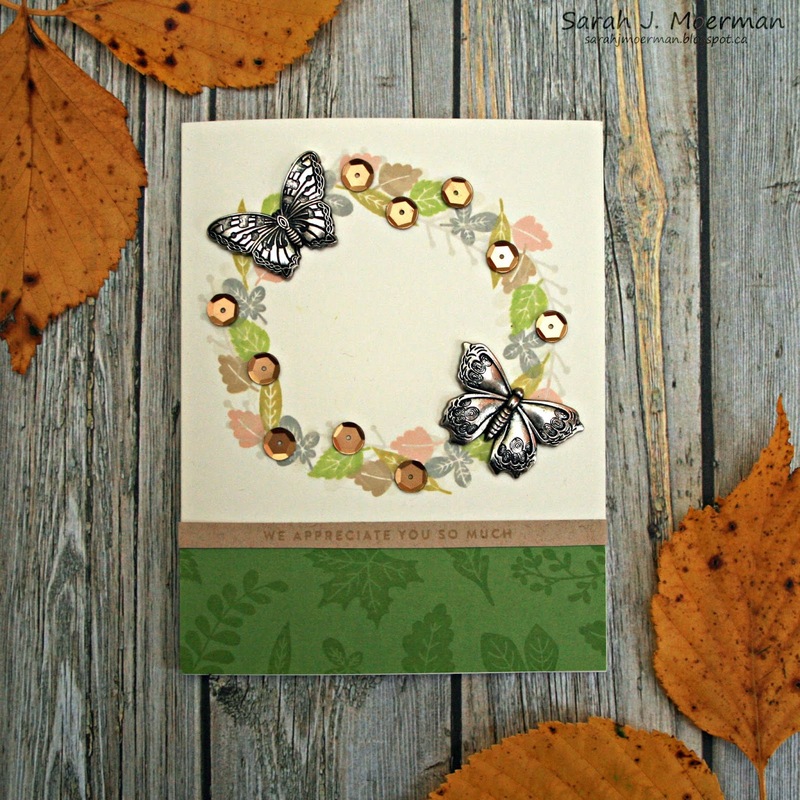 I'm back to share another card featuring the Simon Says Stamp November Card Kit. For today's card I decided to use a number of the leaf images from the Simon Says Stamp Thanks & Leaves Stamp Set to create a wreathe on a notecard made from Simon's Ivory Cardstock. 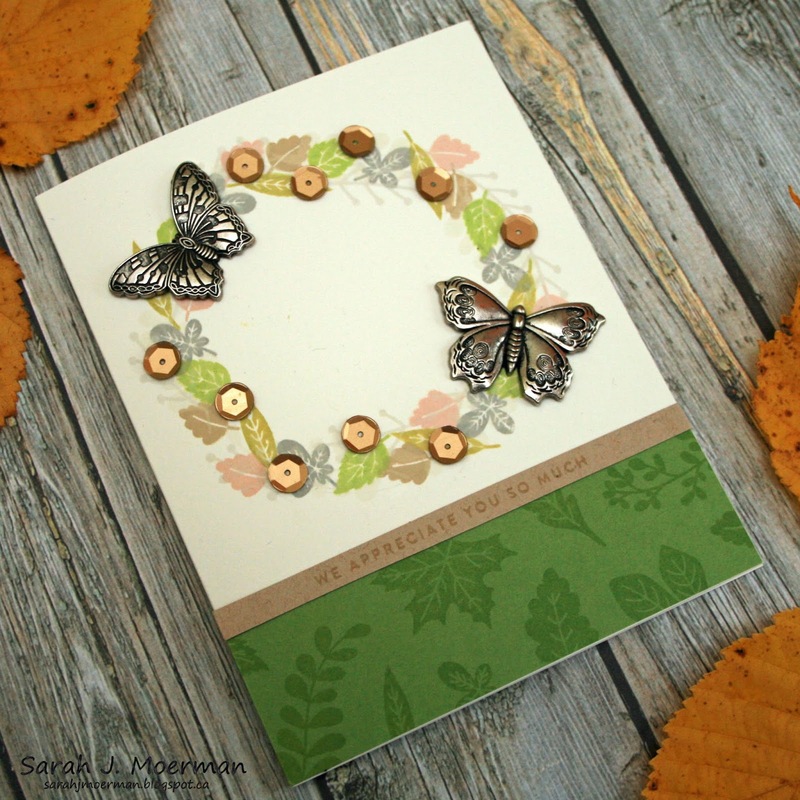 I embellished the wreathe with Simon's Bronze Sequins and two of the Idea-ology Butterflies Adornments. 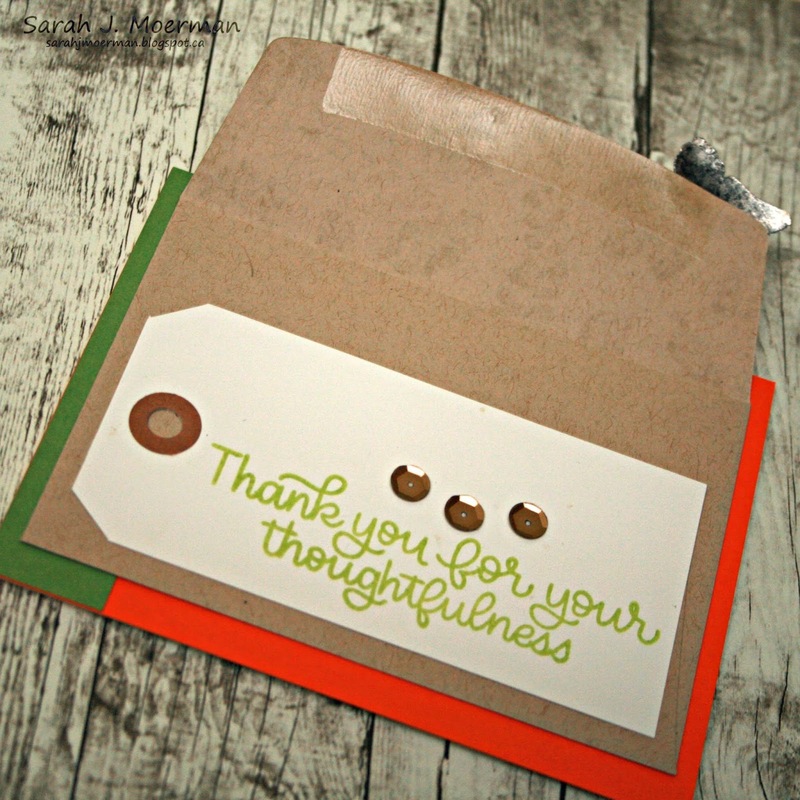 The Green Leaf Cardstock at the bottom was stamped with leaves using Simon's Green Apple Ink. My sentiment was stamped on a strip of Neenah Desert Storm Cardstock using Simon's Khaki Ink. Simon Says Stamp November Card Kit: Thanks & Leaves Reveal & Giveaway! 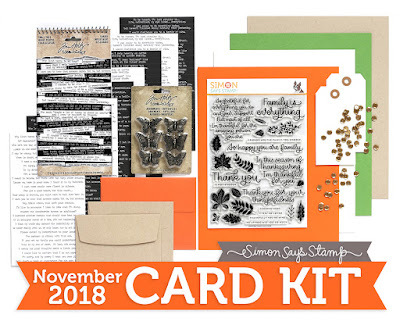 Today is reveal day for the Simon Says Stamp November Card Kit: Thanks & Leaves! This month's kit is about sending thanks (& a bit of snark) and includes Simon's beautiful new Thanks and Leaves Stamp Set with wonderful sentiments and leaf images. 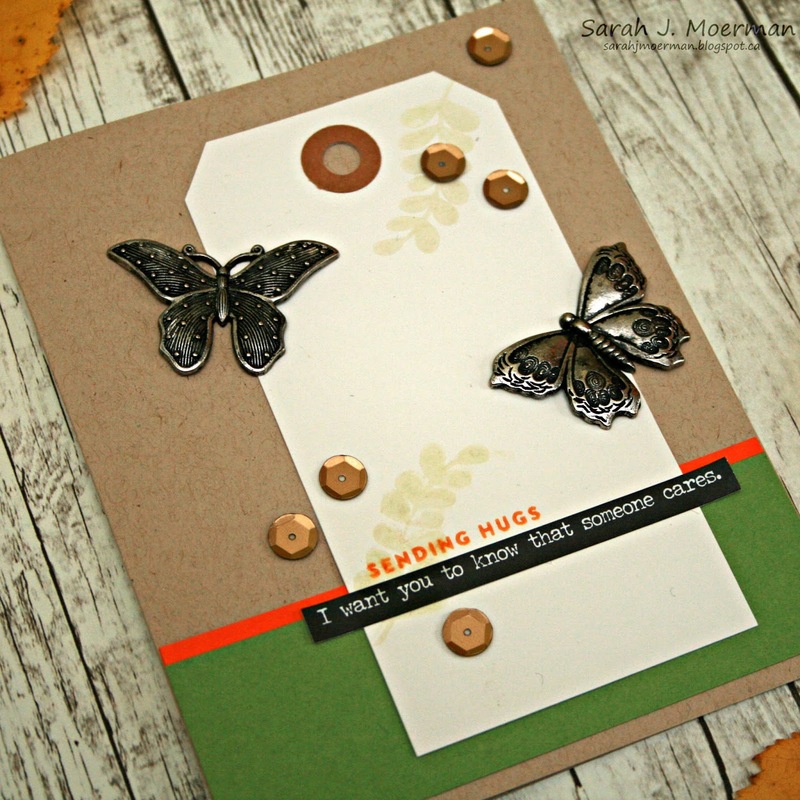 Also included is a package of stunning Idea-ology Butterflies, Idea-ology's Snarky Small Talk Stickers, Simon's Bronze Sequins, as well as some tags, envelopes, and cardstock from Simon Says Stamp. 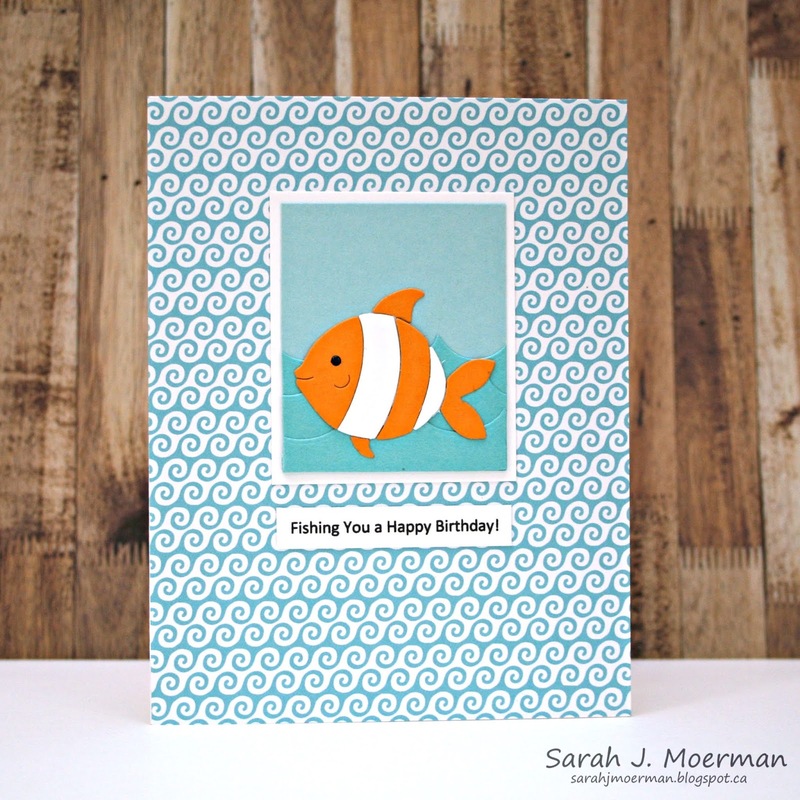 For this card I adhered some of Simon's Green Leaf and Orange Peel Cardstock to a notecard made from Simon's Ivory Cardstock. 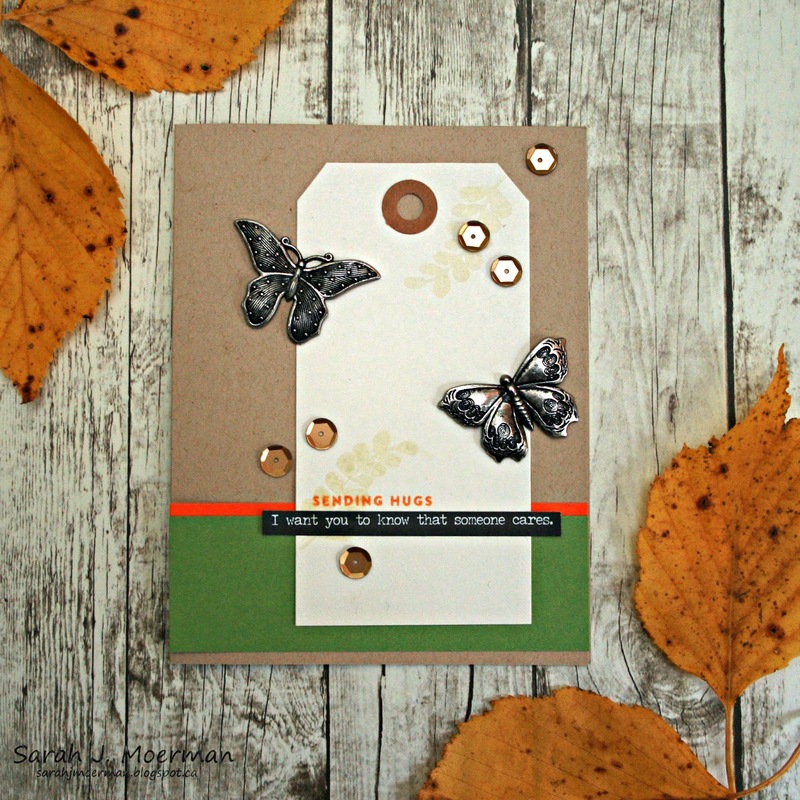 I then adhered Simon's 4 Bar Kraft Envelope to the front (faced down) with some of the leaf images stamped on the flap with Simon's Barely Beige Ink. I adhered the tag in place and stamped the sentiment with Simon's Green Leaf Ink. 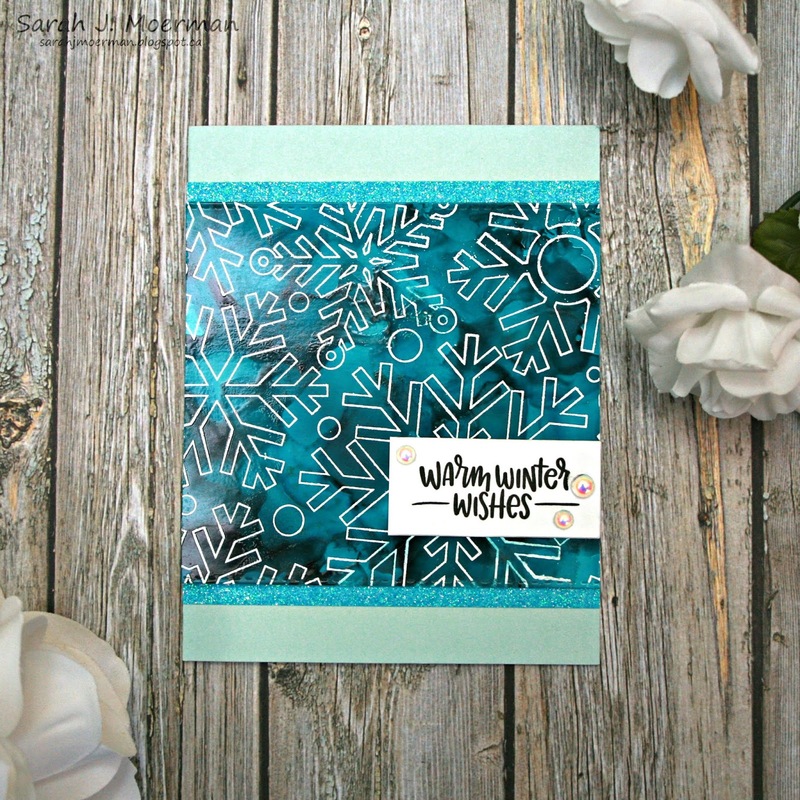 The butterfly and sequins were adhered with Ranger's Multi-Medium Matte in such a way that the envelope could still be opened to include a gift card, cash, or longer letter then could be written in a card. I'm popping by to share some cards featuring a few of Simon Says Stamp's recent sea critter Picture Book Dies. I had so much fun pairing Simon's Picture Book Dies with some computer-generated punny sayings HERE and just had to add to my collection with the cards below.